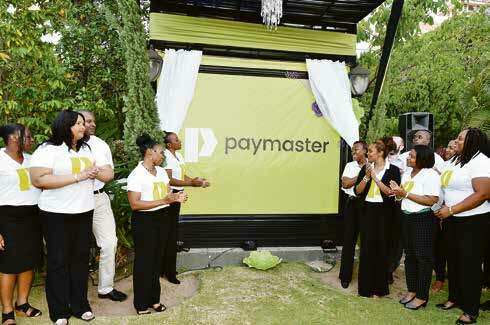 Paymaster, a household brand serving Jamaicans home and abroad, unveiled its new logo on the lawns of Eden Gardens Resort and Spa. The company, in its 20th year of operation, has built its reputation on convenience, reliability, and ease of use. Throughout its history, the company has extended its range and suite of services from its 1st client in 1998 to over 100 clients to date, on whose behalf they provide services from their over 200 locations and online payment portal. Athinia Campbell, Head of Business Development stated that “Now, at the cusp of a new era, by year end Paymaster will be making major technological changes to support improved customer experience, wider payment channels and expanded services, while increasing its activities in the digital space”. She also added “With this strategic move comes a fresh new modern logo. Our design goal was inspired by the need to create a visual identity that conveys our values and complements the users we serve; speaking to the new direction, and new energy of our company. Having engaged one of the global leaders in branding who has worked with Visa, Best Buy, BMW, Siemens and many more, we feel we have delivered something that is crisp, modern, digitally relevant and easy to identify with”. Kerri-Ann Bernard, Head of Operations also announced that “The company will embark on a drive to enhance its service delivery with added customer service training and deepening its engagement interaction with customers”. She continued “We consistently seek new ways to ensure customer satisfaction” and highlighted that “Paymaster will be embarking on a total rebranding of its storefronts over the coming months”. The logo unveiling took place on the lawn of Eden Gardens Resort & Spa on February 21, 2018. The new logo launch comes at the milestone of being in Operations for 20 years, coupled with the undertaking of a major system upgrade to create the foundation for a new and exciting future. This new logo demonstrates vibrancy and heightened energy of Paymaster. It has a global appeal, conveys a spirit of innovation and embraces the digital space.